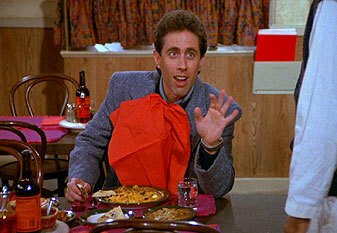 "The Café" was the 24th episode of Seinfeld. The episode was the seventh episode of the show's third season. It aired on November 6, 1991. Jerry, fascinated by an empty and failing eclectic restaurant called "The Dream Café," offers his patronage to the restaurant, and its owner (Babu Bhatt, who became a very popular character) and convinces the owner to restyle his menu and decor. He suggests that Babu make his restaurant the only authentic Pakistani eatery in the neighborhood. Unfortunately, this is a big disaster for Babu because the restaurant still lacks customers and Babu loses a lot of money. He becomes very upset with Jerry and blames him for causing his failure by yelling to Jerry, "You are a very, very bad man!" Elaine takes an IQ test for George, who is worried that his girlfriend, Monica, who needs him to take an IQ test to pass an education course, will not be impressed with the score he receives. This plan backfires, as when Elaine enters the Dream Café (following advice offered by Jerry), she finds it very difficult to work in the distracting environment, and performs poorly on the test with an indicated IQ of 85. Elaine insists that she try again and finally, George begrudgingly agrees. This time, Elaine takes the test at Jerry's apartment and does very well, but just as she's about to leave, Kramer locks himself in with her in Jerry's apartment to escape his mother's ex-boyfriend for not returning a jacket he found. Elaine is too late to return the test to George when Monica finds out.